The greatest dinghy race ever? The sailing medal races have been a hotly contested subject over the years. After many trials of varying formats, they were finally introduced for the Beijing games to try to increase the television potential of the sport. Gone are the days of a team winning gold with a day to spare (the poor TV viewers couldn’t understand that..), and we have been dropped into a situation where a weeks work can be lost from one bad call. The first idea for a “medal race” was brought in at the 2005 49er Europeans, where ten boats would sail on tiny courses in short (ten minute), knock-out races (the last boat being dropped after each race) until only one boat was left. this boat would take home the victory. Sounds great, but in Copenhagen in 2005 Stevie Morrison and Ben Rhodes had led the event from day one, taking a huge lead into the knock-out medal race. However, they ended up losing in the second race, with Chris Draper and Hiscocks taking overall honours. Was this fair? So finally the medal race was introduced, 1 short race (30 minutes) with double points that have to be counted. Now, in the past it has been rare to see the winners lose the event on the day, but in the Olympics, you never quite know. In the 49er medal race, the Danes were leading buy a fair few points as they sailed out to the startline. With big wind and waves, it looked like it would be a pretty exciting race, but they had no idea. Sailing out to the start, their mast buckled (strangely in the same spot ours broke in Kiel.. build defect maybe?) and they were forced to limp home. Everyone watching assumed they were out of the medals, as they had no way of getting a new stick up in time. The race starts, to see boats flipping and capsizing everywhere. Heavywind specialists like the Spanish and Italian teams were falling over, and it looked like the winner would be the guy whio capsizes the least. Even though we had the best sailors in the world on the water, they just could not keep the boats upright the whole way round. Halfway up the first beat, 4minutes and 56 seconds after the start (the startline closes after 5 minutes), a Croatian 49er screams over the line to start the race. Yet, the Croats didn’t qualify… The cameras zoom in to the sailors…. It’s the Danes! They borrowed the Croatin boat, rigged up (with the help of about 20 other guys) and managed to make the start. All they have to do is finish the race in 7th, and hope the Aussies or Italians don’t win, and they take home the gold. 3 laps later, the race is being led by the Italians, followed closely by the Aussies. The Sibellos pull the stick around the windward mark and pop the kite, in big wind and increasing waves. The Aussies closely follower. After a few big troughs, the Italians plough into the back of a steep wave and take off, flipping the boat on its back. 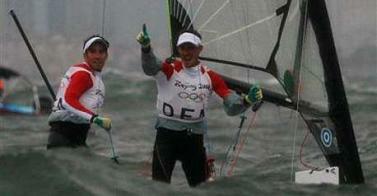 The Aussies overtake, and just need to finish to win Olympic Gold. 500 metres to go. 200 metres to go. One two sail gybe for the finish line, but Nathan slips and they capsize too. Finally, at the back of the fleet, the Danes are catching up. In 7th place, and with the Spanish winning the race, they just have to finish without losing any places and they have gold. But they too capsize just before the line, but manage to get upright again to finally finish in 7th, taking the Gold medal after a long and hard fought series. However, it wasn’t over. The race commitee protested Denmark for sailing someone else’s boat. After a long Jury hearing, the protest was thrown out and Denmark were finally awarded Gold. What an epic race. What a finish to the 49er racing. And what a great advert for the sport.